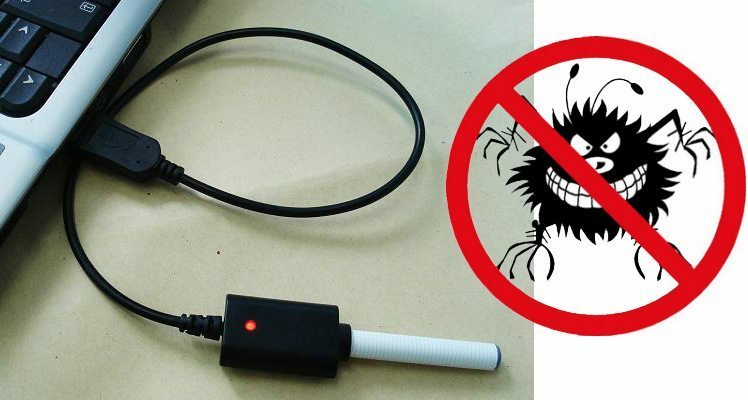 Home Malwares E-Cigarettes Can Give You Malware? – Find it out! Good for the lungs, bad for the computers! E-cigarettes can possibly infect a computer once plugged to charge. E-cigarettes can be a great alternative to traditional cigarettes that is beneficial to health but dangerous to your computers. E-cigarettes have tuned to be the latest course of malware according to the reports online. Numerous electronic cigarettes are able to charge using the USB by plugging the e-cigarette directly to the USB port or by using special cable. Those can be the USB port plugged into a socket wall or the USB port of the computer. This only means that e-cigarettes from unreliable suppliers can gain access to a device. According to a report of social news site Redditsuggested that at least one “vaper” had suffered the cons of trusting their e-cigarette manufacturer. The user writes “one particular executive had a malware infection on his computer from which the source could not be determined”. According to the report, after all traditional ways to cover the infection, the IT started to look for other possibilities. According to Rik Ferguson, the security consultant of Trend Micro, the story is entirely plausible. “Production line malware has been around for a few years, infecting photo frames, MP3 players and more.” As example, in 2008, a photo frame produced by Samsung was shipped with malicious software within the product’s install disc. For the consumers, this is a case of running an up to date anti-malware from the production lines and use only the trusted devices to get counter the threats. From London’s Vape Emporium, Dave Goss says that the vapers can stay safe if they buy stuffs from reliable and respected manufacturers like KangerTech, Aspire and Innokin. To add more on staying safe, check the “scratch checker” at the box that marks out the authentic products from counterfeits. Earlier in November, the figures gathered by Press Association exposed that e-cigarettes and similar devices like chargers got involved with over 100 fires in twoyears.